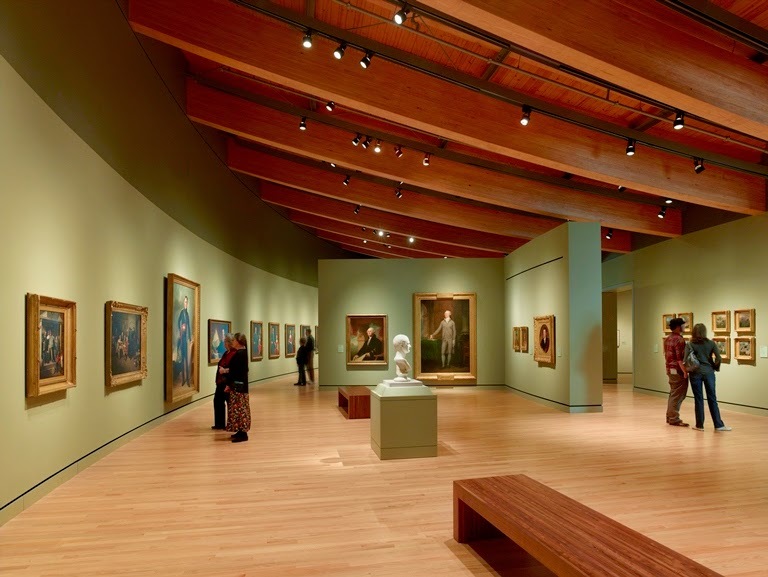 Note from Elizabeth Merritt: Last December I visited Crystal Bridges Museum of American Art in Bentonville, Arkansas, to brainstorm with their staff about museums and distance education. As Michael Edson has pointed out time and again, if museums are to scale up their impact and play a significant role in education in the U.S., they need to exploit the reach of the web. During my time there, Crystal Bridges shared a new initiative they were about to launch: an online course for high school students to take for credit towards graduation. Kirsten Peterson, project director at the educational nonprofit EDC contracted to help develop the project, gave us a brief tour of the course in its pilot form. Anne Kraybill, Crystal Bridges’ distance learning project manager, put me in touch with one of the students who tested the course prototype in 2014. Today’s guest post is by Maddy Windel, a freshman enrolled in a rural public high school, who shares her experience with this foray into online art education. 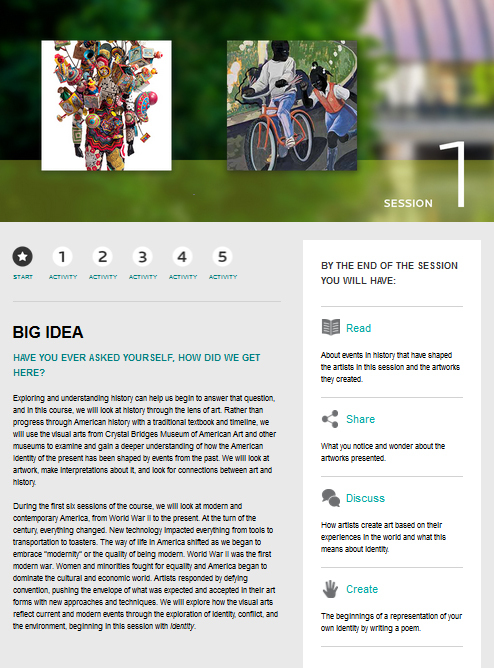 In October of 2014, I was given the opportunity to participate in the pilot of Museum Mash-Up, an online course being developed by Crystal Bridges. My English teacher/mother, Kenya Windel, heard about this opportunity through the ARTeacher Fellowship, an initiative that both she and my father have been a part of over the last few years. Ms. Windel volunteered me for the pilot because she knows I love learning about art in general: What drives the artist? Why did they create this piece specifically? Was it inspired by a big event in the artist’s life? I also love making art. Museum Mash-Up combined all of these interests. I had never taken an online course, but I really wanted to know what one was like (in Arkansas, an online course credit is necessary for all graduates, and I wanted to feel more prepared). I didn’t know that much about the course when I was volunteered. I knew it was about art that could be found at the Crystal Bridges museum—art that has piqued my interest every time I have visited the museum—but that was about it. The pilot started with an immediate communication push. It was a major part of the course, which was a relief to me because I am from an incredibly small school with a group of close-knit students and faculty. I had never had to deal with not knowing or talking to my teachers before, and I didn’t know what it would be like. The amount of communication I received from the course made this transition much easier. In fact, the course had almost the same level of communication as art courses I’ve taken in the classroom. It also offered much more on the history of the art, and the art projects we completed were a bit more open than those in the classroom. The prompts provided the students with the basics–what the art should be about or reflect on–and let us go from there. The course centered on examining, interpreting, and discussing art and the process of curating art (how it’s done, who does it, why they do it, doing it oneself). There were also sessions dedicated to making art, whether through sketching, photography, cartooning, or other means, depending on the session and each student’s personal preferences. Learning deeply about the art and what led to its creation was particularly interesting for me. While I have always enjoyed looking at artwork, Crystal Bridges’ course showed me just how deeply I could go into studying and interpreting art. I developed my knowledge on the fact that the creation of a specific piece of artwork hinged on hundreds of factors that made it what it was. Take, for instance, my favorite pilot session, on the artwork of Andy Warhol and George Tooker. From an unenlightened outsider’s perspective, I could analyze their work in whatever way I chose, but when I dug deeper, I discovered that Warhol insisted he just did art for fun or money, and Tooker was influenced by his neighborhood. I discovered how the artists were raised, how they became interested in art, and how their friendships and their relationships influenced them. All of these factors make the art more intriguing, and I find there is more to look for, or not to look for, a story for each piece. Analyzing this art online also gave me a taste of what the originals may really be like, both physically and emotionally. No digital image of a piece of art compares to what it looks like face-to-face. While some museums may fear that online exposure may keep people away, I believe it does the opposite. Looking at a piece, absorbing it, may be done to a limited extent on a computer, but I cannot feel the presence of the work–the size, the stature, the beauty—online like I can in person. Online art does serve as a good alternative to those who do not have the opportunity to view the artwork in person due to distance, money, or other reasons, and online sharing gives museums an entirely new method of attracting audiences who might not visit the museum otherwise. Pictures and examples of artwork can help make a mark on a new generation of people who live in this visual age. Images can be of much more help to them than a written description. I see the Crystal Bridges’ course as a wonderful opportunity to help students understand and engage with art and with other students who share an interest in it. The course allows students to communicate, work with technology that may be new to them, and enjoy, curate, and make art while being guided by their instructors, but not so rigidly that they don’t get to create their own steps along the way. A few parts of the course were difficult for me personally (I’m not the brightest crayon in the box when it comes to technology), but eventually all my difficulties were resolved. 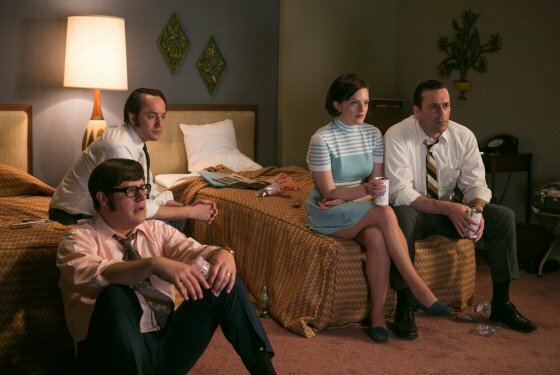 The pilot was a wonderful experience. It was one I would love to repeat, and I’ve begun to do just that by taking the course for credit this semester. It’s thrilling to be able to look back and acknowledge, even early on, a conscious change in understanding from taking a course like this, and I hope that feeling is one many students can experience in the future through online interactions and in-person visits to museums such as Crystal Bridges that offer these educational opportunities. Crystal Bridges Museum of American Art is currently offering the course through Virtual Arkansas for Arkansas public school students. Plans are underway to distribute the course to teachers in any state or country. Check out Crystal Bridges Museum of American Art’s Distance Learning website, which includes research and resources made available to support your distance learning initiatives. The term “distance learning” can seem antithetical to art museums that espouse the power of an authentic experience with an object. As I worked to develop a distance learning initiative at Crystal Bridges Museum of American Art, I struggled to reconcile the rationale for such a program. After all, Crystal Bridges has a robust and well-funded school visits program that brings students from all over the region. Why would I want to create a program that did not take place within our walls? First, let me provide a little context. 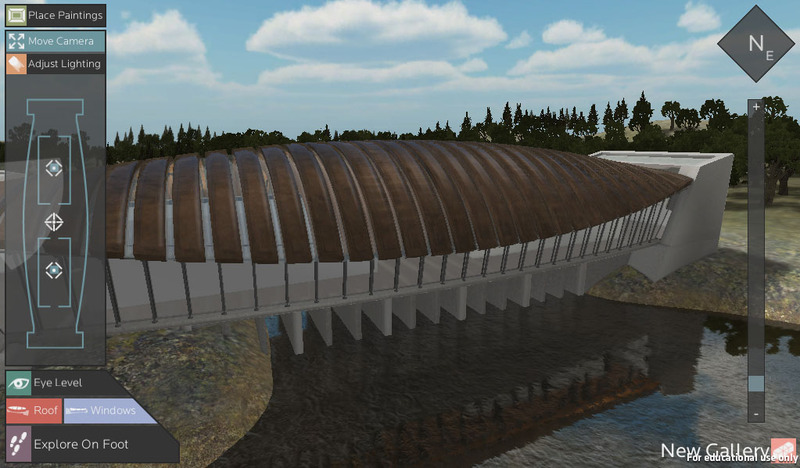 Crystal Bridges decided to pursue a distance learning initiative shortly after the field trip study conducted by Jay Greene, Brian Kisida, and Dan Bowen at the University of Arkansas. The findings revealed that student gains from a one-time fieldtrip in a variety of outcomes were two to three times higher for students in rural locations. With these findings in mind, we decided to create a distance learning program that would reach more students overall, but particularly students in these rural schools. We began with some formative research to determine what path we might take. In July 2013, we hosted a Distance Learning Summit, which brought together more than 40 art museums and arts organizations to better understand the current landscape and approaches to distance learning, as well as envision the future of how art museums might further leverage distance learning. Case study presentations included traditional approaches such as synchronous video conferences—often branded as “virtual fieldtrips”—that connected classrooms remotely, to blended approaches that utilized Learning Management Systems (LMS) before and after an onsite program, to asynchronous approaches such as a Massive Open Online Courses (MOOCs) that engage thousands of learners at one time. While all of these approaches have advantages and disadvantages to consider, the model that resonated with our particular situation was presented by Michelle Harrell and Emily Kotecki from the North Carolina Museum of Art (NCMA). In an effort to increase their reach to teens, they partnered with North Carolina Virtual Public School to develop online courses in the visual arts for high school students throughout the state of North Carolina. This model resonated for a few reasons. First, in the state of Arkansas we have the Digital Learning Act that requires all high school students to take an asynchronous online course for graduation, so this approach was a natural fit. Second, the notion of having such a direct role in a student’s school career was appealing and provided a level of accountability not found in most art museum/school partnerships. Following the trail Michelle and Emily had blazed, Crystal Bridges set out to develop a for-credit online course with the aim of deeply connecting high school students to art history, American history, and museum studies. After an RFP process, we selected Education Development Center, Inc. (EDC) as the development partner. Over the course of a year, a cross disciplinary team of museum educators, instructional designers, subject-matter experts, graphic designers, and programmers, developed Museum Mash Up: American Identity through the Arts. Rather than progress through the artworks chronologically, the course begins with contemporary art. The guiding questions ask students “How did we get here? 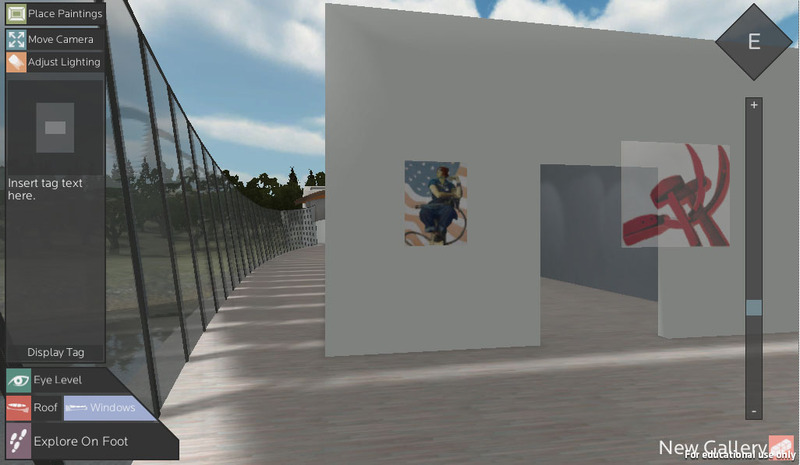 And how have artists shaped and reflected upon American identity?” Crystal Bridges partnered with Virtual Arkansas to offer and deliver the course. Like North Carolina Virtual, Virtual Arkansas is a supplementary provider of online courses that any public school student in the state can take. EDC and Crystal Bridges trained a few online arts instructors from Virtual Arkansas with volunteer students to test the activities and get formative feedback from both instructors and students. The course has now launched through Virtual Arkansas with a pilot group of about 40 students from all over the state, including the community of Deer, population 680; the community of Hugh, population 1,441; and the community of Star City, population 2,248. Students typically log onto the course during one of their class periods at school. Though the course is asynchronous, students are paced in weekly units and use tools to engage in online discussion. This was one of the most important elements for the design of this course. While there are many valuable websites and other online resources to learn about the arts, we wanted to be sure that the act of “collaborative meaning-making” was not lost. Similar to an onsite program, students begin their lesson by looking at the work of art and sharing their initial observations and interpretations using VoiceThread™. This tool allows for a conversation in the cloud using text, video, or audio and is an excellent platform for students to build on one another’s ideas. 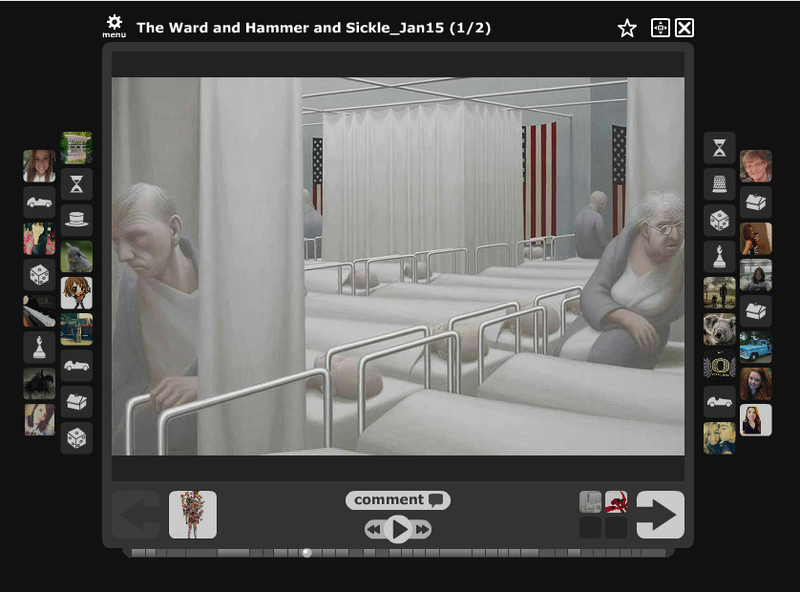 Following their initial observations in VoiceThread™, the students read about the art and engage with multi-media materials to ascertain some context about the art, artist, and historical time period. They then participate in another, more in-depth discussion about their new and evolving interpretations. Simultaneously, students are also working on two major capstone projects. The first project is a curated exhibition about their own individual identity using the tool Kapsul™ somewhat similar to a Pinterest board. Through this project, along with videos by curators, designers, and educators, they learn about the curatorial, design, and interpretive process necessary to curate an exhibition. These skills are used in their final project: a virtual exhibition curated by each student using the artworks they learned about during the semester, and research new works in the Crystal Bridges collection. This amazing virtual rendering of the Twentieth-Century Art Gallery at Crystal Bridges was created by David Charles Frederick from Tesseract Studios at the University of Arkansas using Unity™, an immersive game engine that includes rich textures and allows the students to explore the space as if on foot. The rendering is completely accurate to the specifications from the museum blueprints and provides learners with an immersive experience in which they arrange paintings they have researched on the walls, write the labels and interpretation, develop the graphic identity of their exhibition, and most importantly, learn that they can make meaning and conversations between paintings and across history. Along the way, there were many challenges to overcome and there will be many more as we continue to pilot the course. Content for all of the artwork had to be generated requiring a mass amount of writing. Image rights had to be procured, videos needed to be produced, and external content from primary and secondary sources had to be found. One of the most challenging hurdles we had to overcome was the course approval process with the Arkansas Department of Education. Because this was not a standard course, the state had to approve it under a standards framework. After much work and standards alignment, we were able to obtain course approval for students to receive .5 credit hours in fine arts. The course now satisfies two requirements all high school students must meet for graduation; a .5 credit hour in fine arts, and at least one course taken online. Student One: it looks like there is a bunch sick people laying (sic) in hospital. like it looks like the ones already laying down are dead. In addition, for many students this is the first time they have taken an online course, so they need support in learning the tools plus very well-defined and articulated expectations of the level and quality of work the course requires. Everyone is making significant progress. For example, early responses from all but a few students were rarely justified, but just five weeks in, student are better articulating their interpretations with more detail and inference, and justifying their claims with evidence. Overall, the benefits far outweigh the challenges. There is a level of anonymity for each student that is freeing. They are not burdened by labels that they might encounter in their physical school. They are also able to contribute their ideas without ridicule. The way in which they engage with works of art and learn about the works is multi-model. And they are connecting with Crystal Bridges and the collection in a way that a one-time fieldtrip could never afford. In addition, Crystal Bridges is providing a unique course-offering to the state that expands access to quality arts education. Conduct an observational study of the current section of Museum Mash Up to analyze instructional design and quality, and measure student perceptions. Follow the observational study with a rigorous, experimental design to measure student outcomes including critical thinking and writing. Host an online professional learning community where teachers can receive support in teaching the online course. Host a second Distance Learning Summit (details forthcoming this summer). This project has been one of the scariest and most fulfilling in my career. The students are not the only ones who have a stake in the course; we as a museum cannot fail our obligation to them. I could not have conceived of it without the ground-breaking work by Michelle and Emily at NCMA. I also have to thank the talented and dedicated Crystal Bridges museum educators, Emily Rodriguez and Donna Hutchinson, for all their help in developing, researching, and designing the course outline, as well as EDCs project manager, Kirsten Peterson, for her unwavering dedication and belief in this project, and Diana Garrison, teacher extraordinaire at Virtual Arkansas. I wanted to take the opportunity of this volume’s publication to begin writing more about Connected Learning, sharing its principles and exploring more connections with the practice of teaching and learning in museums. Below is the text of my case study entitled “Openly Networked Learning in and Across Art Museums,” published first in February 2014 as part of the Teaching in the Connected Learning Classroom volume. This short case study examines the aspects of “openly networked” reflective practice in my work as a museum educator and blogger, pushing forward the concept of museums as spaces where communities of learners can connect, intersect, make, collaborate, and share. I encourage anyone unfamiliar with Connected Learning to learn more by visiting connectedlearning.tv or downloading the 2013 report Connected Learning: An Agenda for Research and Design — and I plan to write more here at ArtMuseumTeaching.com in the near future. What happens when educators converge around shared interests and purposes in the spaces of museums? How can museums more effectively build diverse networks of educators that support our teaching and learning practice? Faced with the complex landscape of formal and informal education in the 21st century, museums across the globe have been rethinking their role as actors within their educational community. Not only are museum galleries increasingly becoming open spaces in which communities of learners can connect and intersect, but museum professionals are also developing online spaces of exchange and reflective practice. As a practicing art museum educator as well as a museum blogger, I find myself constantly in the process of discovering how “openly networked” an art museum can be. While the growth of online learning communities and Google Hangouts for museums certainly promotes this principle of connected learning, I want to begin by focusing on how museums can support openly networked experiences in the analog, physical space of their galleries. In November 2011, I was invited to lead an in-gallery workshop for educators at the High Museum of Art as part of a conference hosted by Harvard University’s Project Zero. The experience centered around an extended engagement with Jackson Pollock’s “Number 1A,” 1948, which was on loan from the Museum of Modern Art in New York as part of a special exhibition. Instead of an experience guided by information, we began an open, embodied exploration through a series of scaffolded exercises that included slow looking, sharing observations, quick sketches, free writing, and variety of ways to use sound and movement to create responses to the work of art. Small groups of participants were then invited to pull together sounds, movements, and words to develop creative a public performance in response to the Pollock painting. One memorable group of three teachers worked together to choreograph a short piece that used their bodies to perform their response to the complex layering of paint and brushstrokes. Freely responding to this single painting through multiple access points as well as public performance, we were able to have a collective learning experience outside of our comfort zone and then immediately “poke at it” and see into the experience as a group. In this case (and many others like it), the art museum becomes a safe, open, and public space in which professional educators from museums, schools, and universities can come together to make learning visible and then reflect upon our practice in a shared space. 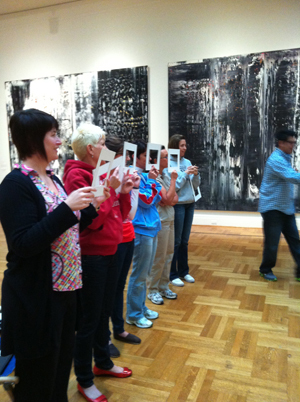 community of educators openly exploring learning processes at the Saint Louis Art Museum in 2012. While an art museum gallery can be an amazing place to meet with a class or group of teachers, museums and museum educators must work to actively support openly networked learning experiences. First of all, museums need to see teachers and students as active participants in the learning experience, pushing beyond mere “spectating” or “learning at a glance” toward a more participatory and process-oriented experience. Part of this involves museums letting go of their ‘authority’ over knowledge and meaning-making, and instead empowering educators to co-create learning experiences with museums — as opposed to passively receiving content from museums, whether that be text panels, audio guides, curators, or museum educators. Part of achieving this “letting go” is simply valuing teachers’ voices and recognizing teachers as creators of content, knowledge, and meaning in relation to museums. Professional development workshops can be re-envisioned with more of an emphasis on developing communities of practice where we learn from each other no matter what our “home” educational setting might be (school classroom, university, museum, etc.). This sense of creating a community of practice then builds toward a shared, reflective process that leads to professional growth on the side of both teachers and museum educators. The openly networked reflective practice described here does not need to be confined within the walls of a single museum, though. This is where my experience as a museum blogger has expanded the way that people can connect around issues of museum teaching and learning. After facilitating the educator workshop at the High Museum of Art back in 2011, I decided to create a multi-author online forum to publicly reflect on my own teaching practice, spotlight the practice of other educators, and provide a space for conversation around larger issues of teaching and learning in museums. Since its launch in February 2012, ArtMuseumTeaching.com has brought together more than 30 authors actively contributing to a growing online community of practice that reaches out to thousands of educators each month. 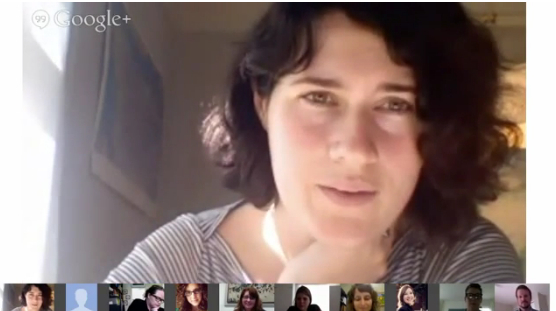 In addition to standard blog-style posts and comments, the site has hosted face-to-face Google+ Hangouts On Air with museum educators and teachers from across the world. The site creates a networked space across museums and teaching contexts, allowing readers and contributors to see into and reflect upon the practice of a wide community of educators. In their 2012 book Networked: The New Social Operating System, Lee Rainie and Barry Wellman have argued that large online communities actually expand opportunities for learning, problem solving, decision making, and personal interaction. As ArtMuseumTeaching.com continues to expand as an online space for reflecting on museum practice, I have been exploring how we—as museum and education professionals—maneuver within a technology-mediated world in a way that allows us to cultivate productive, human-centered networks and communities. Museums and schools have been widely engaged in how digital media and technology can connect them with their students and audiences. But what about the potential of these same technologies to build entirely new “communities of practice” among professionals—whether teachers, university faculty, or museum educators? 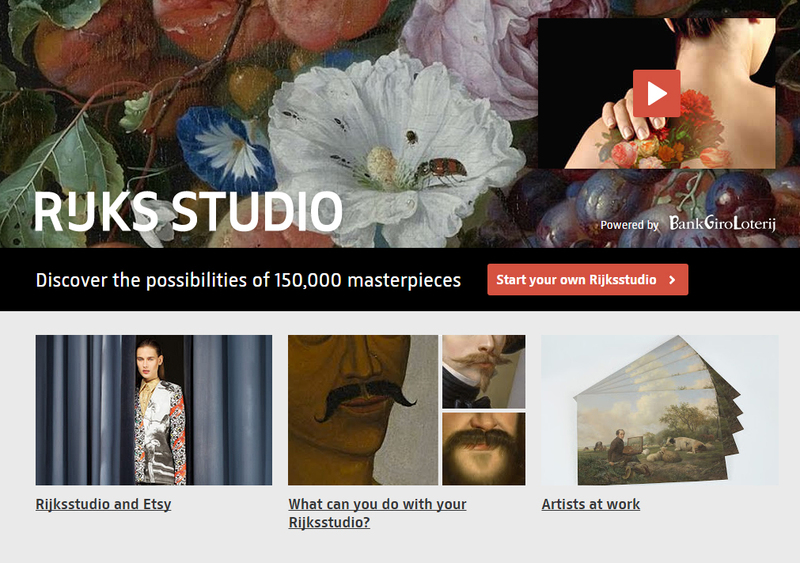 I am especially interested in the ways in which an online community like ArtMuseumTeaching.com can, in turn, bring people with shared interests together in physical spaces in new and meaningful ways. Since 2012, the ArtMuseumTeaching community has hosted several in-person gatherings, including conference sessions, happy hours, and recently the first-ever Museum Teaching Throw Down as well as Gallery Teaching Marathon. As many as one hundred people have come together for these face-to-face social experiences — creating new professional connections and enriching existing collaborations that continue to grow through the online/digital forum. After all, the relationships we develop online are complex, as a simple Twitter follower or blog reader can quickly become a close colleague, friend, and mentor. One ArtMuseumTeaching.com Google Hangout in 2013 brought together educators from Australia to New York in real time, and these connections develop new peer networks, partnerships, and professional exchanges that help us all grow personally and professionally. Through this work that I have been engaged with thus far — both online and in the physical spaces of museum galleries — I feel that the art museum has begun to make a shift in what it has the potential to become: a dynamic cultural landscape where authentic, learner-driven experiences are developed and enacted by teachers and their students. 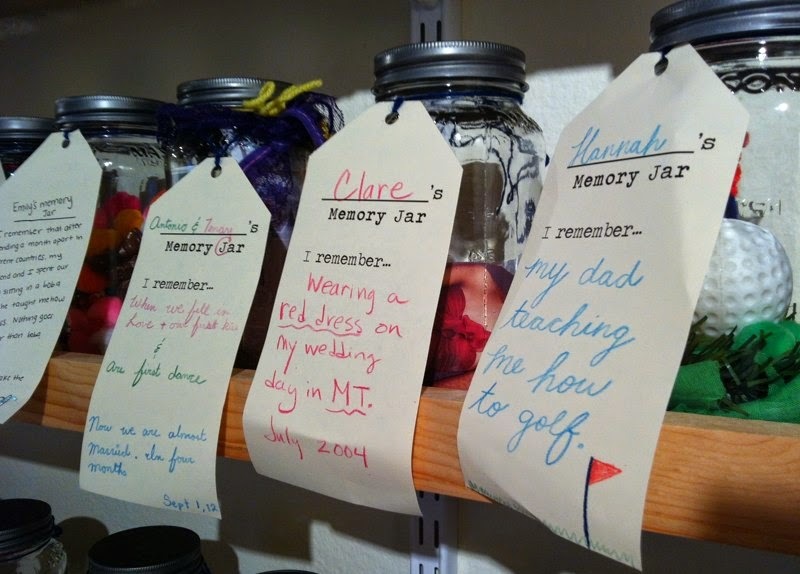 These experiences are opening up museums as places for educators to chart their own path in unpredictable ways, and to invite parallel exploration, risk-taking, and fresh discovery on the part of learners across a variety of contexts. Originally published in: Garcia, Antero, ed., 2014. Teaching in the Connected Learning Classroom. Irvine, CA: Digital Media and Learning Research Hub. 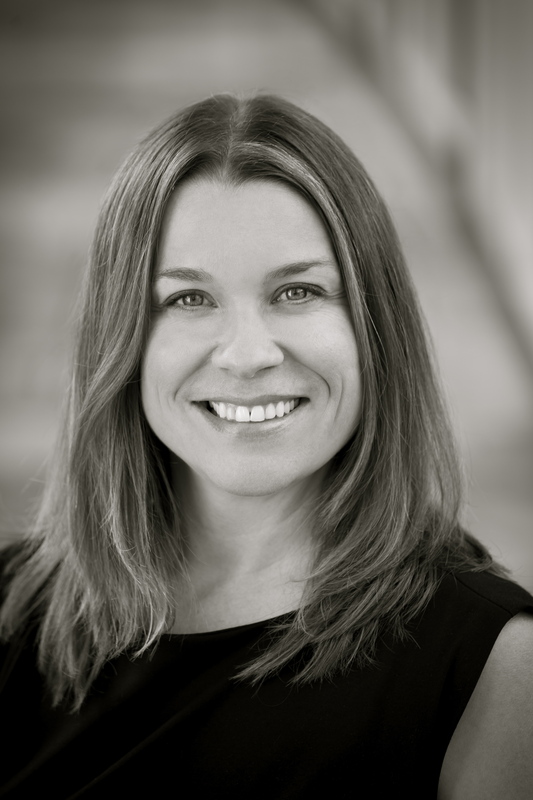 This report series on connected learning was made possible by grants from the John D. and Catherine T. MacArthur Foundation in connection with its grantmaking initiative on Digital Media and Learning.